• Are to be graded in such a way that incorrect answers are identified as correct and correct answers as incorrect. No tests that are so flawed should be given to anyone. Certainly, with stakes so high for students and their teachers, these Smarter Balanced tests should not be administered. The boycotts of these tests by parents and some school districts are justified. Responsible government bodies should withdraw the tests from use before they do damage. Question 2: A circle has its center at and goes through the point . A second circle is tangent to the first circle at the point and has the same area. What are the possible coordinates for the center of the second circle? Show your work or explain how you found your answer. I highly recommend reading the report in its entirety. I found the following blogpost very intriguing. This sounds like an engaging way of teaching children how to multiply, whether or not the Common Core was the educational fashion of the day: http://mathcoachscorner.blogspot.com/2014/08/a-peek-inside-theres-nothing-alien.html. Division 1: A discussion about the usefulness of unorthodox ways of teaching long division. Division 2: A continuation of the above discussion. Subtraction 1: Introducing a viral picture about the Common Core, and its easy solution. Subtraction 2: The pedagogical rationale for using an open number line (even though I personally do not endorse this technique as superior to other ways of teaching subtraction). Subtraction 3: The abject failure of current developmentally inappropriate ways of assessing the depth of a student’s mathematical knowledge. Subtraction 4: The importance of engaging parents when unorthodox methods are used to teach mathematics to children. The following picture has been making the rounds lately. My bedrock position is simply stated: I’m for teaching any technique in elementary school that’s (1) logically correct, whether or not it’s the way it’s (mythically) “always been taught,” (2) encourages students to think mathematically, as opposed to mindlessly following a procedure with no real conceptual understanding, and (3) prepares students for algebra in a few years’ time. That said, I have a lot of opinions about this picture, which does not necessarily align with our society’s impatient obsession with 10-second sound bites and 140-character tweets. So be it. I will divide my opinions into several categories of increasing scope. The solution of this particular question. The pedagogical reasons for using this technique (called an open number line). In other words, do we only want Jack to get the right answer, or do we want Jack to understand something about the logic behind the answer? The difficulty of assessing the depth of a student’s knowledge in a way that is developmentally appropriate. The importance of engaging parents with unorthodox ways of teaching mathematics. Some of my opinions will line up nicely with supporters of the Common Core. Other opinions will align with the Common Core’s thoughtful critics. This is Part 4 of this series of posts: the importance of engaging parents and caregivers when unorthodox techniques of mathematics are taught. I’ve only witnessed the implementation of the Common Core from afar, but there’s absolutely no doubt that the professional development of teachers who have been asked to teach math in a new way has left a lot to be desired. Ditto for explaining these new approaches to parents and caregivers who want to help their children. Parents generally bought into the technique that evening. I’m not sure that they would have bought into it if its rationale had not been carefully explained to them. And, as a reminder, Texas is not a Common Core state. The failure to explain to parents and caregivers unorthodox but correct ways of teaching mathematics has been perhaps the greatest failure of the roll-out of the Common Core. It’s unacceptable that children are crying over their math homework and parents feel powerless to help (a common theme that I’ve heard over and over again from my friends). Teachers and parents ought to be natural allies in wanting children to have a greater depth of understanding of arithmetic that will prepare them for algebra later. However, because the strategies of teaching the “why”s of mathematics have generally not been carefully explained to parents, they naturally feel somewhat helpless when trying to help their children with their homework. Letting children use their own natural curiosity to get at they “why”s of mathematics is good. Letting children use their own natural curiosity and also having the support of parents at home is better. So what research has been done on strategies on successfully engaging parents with how mathematics is currently taught versus how it was taught a generation ago (or, more accurately, what parents remember of their own experiences from elementary school)? To my surprise, people that I greatly respect did not have an immediate answer to my question. So I’m guessing that while there’s been a lot of research into successful strategies for teaching mathematics in the classroom, there hasn’t been a lot of research into how these strategies can be supported when children are away from the classroom and asking their parents for help on their homework. I’ll repeat the close of yesterday’s post: I won’t defend the indefensible way that the Common Core has been rolled out. Voters will be more than justified in voting out anyone who supports the Common Core if its implementation isn’t fixed in the very near future. This is Part 3 of this series of posts: assessing the depth of a student’s knowledge of mathematics in ways that are developmentally appropriate. To be blunt, this has been one of the great weaknesses of the roll-out of the Common Core in the early years of its implementation. I’m happy to defend the standards of the Common Core themselves, but it’s patently obvious that the implementation of the Common Core standards were driven by textbook publishers and not educators. I don’t doubt that much of what’s assigned for homework under the guise of the Common Core is developmentally inappropriate. I’m perfectly happen to defend the logic behind a specific pedagogical technique like the open number line. But I can still be genuinely annoyed that the first years of the Common Core has been so badly botched. And I’m especially annoyed that most public defenders of the Common Core seem deaf to the legitimate and thoughtful complaints of its critics (as opposed to the braying expressed in the original picture). Here’s another example that made the rounds in recent months, for which I have a considerable amount of sympathy. Mr. Yumata’s class has 18 students. If the class counts around by a number and ends with 90, what number did they count by? The “correct” answer requires students to divide 90 tick marks into equal groups of 18, counting the number of tick marks in each group. Again, the textbook publisher missed the mark. The phrasing of the problem asks for just the answer (5). If the problem wants to know a rationale for the answer, then it should have been phrased in a different way. There absolutely is a place in the curriculum for the method described in the video — dividing objects into piles of to see how many objects are in each pile. This works well when children are first exposed to division and and are reasonably small integers. However, by the time students get to and , another method should be used. By this point, dividing objects into piles is logically correct but pedagogically questionable, as it requires precisely 108 steps (as noted in the video). Any little careless mistake in counting will lead to an incorrect answer. Flatly, I won’t defend the indefensible way that the Common Core has been rolled out. The textbook publishers have clearly missed the mark on how to assess the depth of a student’s knowledge. Voters will be more than justified in voting out anyone who supports the Common Core if its implementation isn’t fixed in the very near future. This is Part 2 of this series of posts: the pedagogical reasons for using an open number line. I firmly reject the premise, implied by the picture, that the only goal of teaching mathematics is just getting the right answer. If that’s the goal, then we can eliminate much of the K-5 curriculum by handing out 19-cent solar calculators to every student. That will pretty much guarantee that the students will solve elementary arithmetic problems like the one shown. It will also fail to develop their higher-order reasoning skills and leave them hopelessly unprepared for algebra. A great example of a teacher using children’s natural curiosity to foster mathematical thinking can be seen in this video: https://www.teachingchannel.org/videos/common-core-teaching-division. I absolutely agree with Common Core critics that students in elementary school should, at the end of the day, be able to quickly compute 427-316 using the standard algorithm in 5 seconds or less. I would also argue that it’s also important for students to learn why is algorithm works and not just how to use the algorithm. This deeper level of conceptual understanding begins to lay the foundation for the more abstract thinking required in later years. So I take great issue with the quote “The process used is ridiculous and would result in termination if used.” Of course the process is ridiculous for people who already know how to subtract. For students who are first learning how to subtract multi-digit numbers, however, it is a completely appropriate way to introduce students to the topic which will lead them to the standard algorithm for subtraction. Once learned, then there will be no need to revert back to the previous method. I have heard some critics say that teaching the “why”s of mathematics, using the open number line and other techniques, merely favors the stronger math students and the expense of the weaker students. Perhaps this happens in some classrooms. However, this has not been my personal experience. I have supervisory authority over aspiring teachers who have taught math to literally thousands of third, fourth, and fifth graders — all in a non-Common Core state. With careful supervision, they have used the children’s natural curiosity and inductive reasoning (but not deductive logic — that’s an important distinction) to get at the “why”s of mathematics as well as the “how”s. And I’ve not personally witnessed anything like the frustrations that I’ve heard as the Common Core has been implemented. Hence my “don’t throw out the baby with the bathwater” approach when I hear and appreciate legitimate concerns and frustrations with how the Common Core has been rolled out. One more thing: a great motivation of the Common Core has been to improve student achievement in algebra by fostering mathematical habits of thinking in the lower grade levels. It’s certainly debatable about whether or not this ideal has been achieved. But the motivation for the Common Core and improving conceptual understanding at the lower grade levels is to increase access to higher-level mathematics, not to favor the high achievers. I do recognize that teaching children multiplication and especially division with a base-10 kit is very cumbersome and is significantly easier using an open number line. So I see the rationale for using an open number line for addition and subtraction if it will be used in later years to teach multiplication and division. I don’t support requiring children to learn subtraction or any other concept in mathematics by any one specific technique. The big issues are (1) getting the right answer and, of equal importance, (2) understanding why the answer works. I take issue with the original picture because it favors (1) but not also (2), and a surface level of understanding will not serve students well when they hit algebra. Bottom line: I have absolutely no problem with schools using a technique like the open number line, as it is a mathematically correct way of explaining to students why the answer works. Jack correctly started at 427 on the number line. He then correctly understood that 316 consists of 3 groups of 100, 1 group of 10, and 6 groups of 1. He then correctly subtracted 3 groups of 100 (for an interim answer of 127) and then correctly subtracted 6. However, he forgot to subtract 10. That’s why he got a wrong answer (121) that was 10 more than the correct answer (111). Just to make sure I wasn’t completely missing the mark on this, I rewrote the problem (without the handwritten commentary) and showed it individually to a few elementary school students. They all saw Jack’s mistake within 15 seconds. They may not have been able to explain what Jack did right and what Jack did wrong in the form of a letter (more on that in a later post), but they certainly identified the core problem quickly. I understand a parent’s frustration with knowing how to subtraction but seeing a child learning subtraction in a different way. (More on that in a later post). I also understand that some may argue with this technique of teaching children how to subtract. (More on that in a later post.) 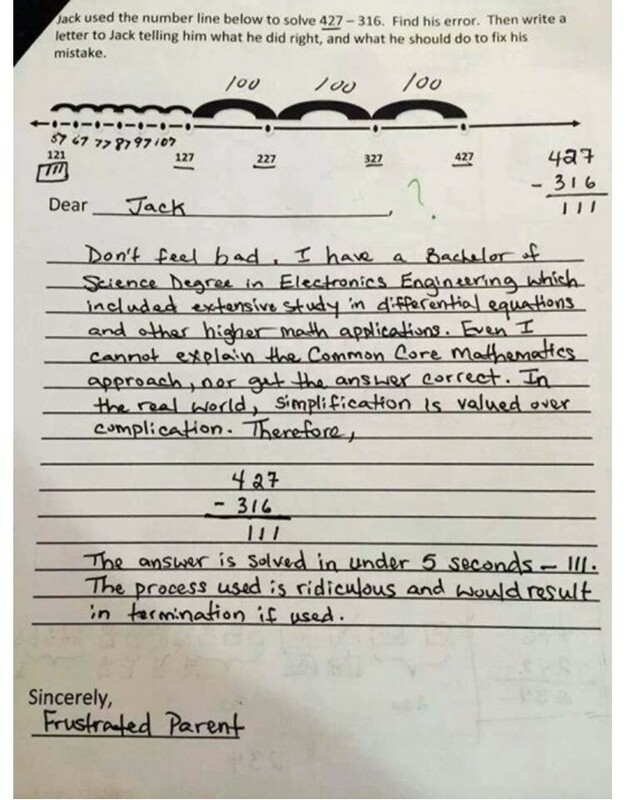 But there’s no way to sugarcoat this: an engineer who took differential equations and read this problem but couldn’t figure out that Jack forgot to subtract by 10 has little conceptual understanding of mathematics. So let offer some free advice to critics of the Common Core who want to share this picture to vent their complaints. I am totally sympathetic with frustrations expressed in this picture. Sharing this picture with your fellow critics may feel good, perhaps with the self-justification “If an engineer can’t figure this stuff out, then how can I?!? !” However, sharing this picture is not going to persuade anyone who disagrees with you to your cause. Remember: some children can solve this problem in 15 seconds or less. If anything, sharing this picture only communicates to those who disagree with you that the critics of the Common Core are the people who have little conceptual understanding of elementary school mathematics. Once again, I am sympathetic to the emotions expressed in this picture, but there are better ways of criticizing the Common Core and persuading its unabashed supporters to your cause. In the posts that follow, I will provide plenty of criticism of how the Common Core has been implemented in its initial years.